Clocking in at speeds up to 10.5 mph and featuring a coil-over shock suspension system, the Cheetah is truly a remarkable zero-turn mower. The ZT-3400 transaxles are built to last and deliver smooth and positive drive performance. The large 10 gallon fuel capacity (dual tanks) keeps you in the field cutting grass. Fill up in the morning and cut all day long. From the heavy-duty, Tri-Plate Velocity Plusâ„¢ side discharge cutter decks, to the various high-power engine options, there's a Cheetah that will increase your productivity and leave your competition in the dust! Contact your local Scag dealer for a field demonstration today. 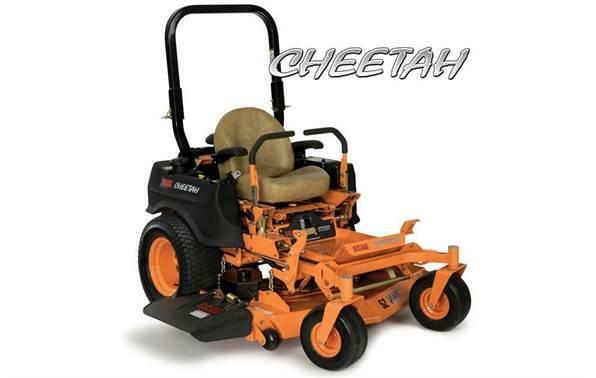 The Cheetah is pure Scag quality with ultra-fast ground speeds, a soft ride and a cut that is "Simply the Best." The Scag Cheetah equals productivity. Operator Suspension System isolates the operator foot and seat platform via a coil-over shock and rubber iso-mounts. The operator platform (seat and foot plate) are suspended to deliver a smooth ride, with only three moving parts (front pivot, rear pivot and shock...that's it!). In addition to the platform, 3-position deck lift foot pedal combine to provide unprecedented levels of adjustability and ergonomics. Up to 10.5 MPH ground speeds keep productivity at a maximum. Dual Hydro-Gear ZT-3400 transaxles deliver smooth yet powerful performance. ZT-3400 transaxles feature 12cc pumps and 16cc motors. Dual cooling fans keep the 5 qt. oil system running at optimum temperatures for top performance and long system life. 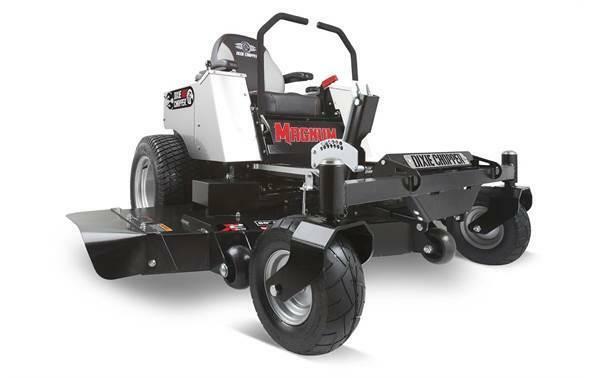 Choose a 48 " or 52" Velocity Plusâ„¢ cutter deck and match that with a Kawasaki FX series or Kohler EFI engine. Dual fuel tanks, 10 gallon total capacity, keeps you in the field cutting grass. Fill up in the morning and cut all day long. Fuel tanks are positioned low, enhancing the mower's low center-of-gravity and giving it excellent hillside stability. Tiger Eye Advanced Monitoring System keeps a constant, real-time "eye" on important system functions on your Scag Cheetah. Depending on engine selection, a wide variety of systems are monitored in real-time, giving you valuable information in just a glance, right from the operator's seat. Backlit panel makes viewing easy in all conditions. Tube steel main frame construction delivers superior strength and ensures years of trouble free service. This design is much stronger than "bolt together" frame designs. The main frame was designed for an ultra-low center-of-gravity to increase hillside stability. The Ogura GT3.5 PTO Clutch Brake delivers up to 250 ft. lbs. of starting and stopping torque. Adjustable air gap ensures long component life and reduced maintenance costs. Other brands of electric clutch do not have adjustable air-gaps and once they are out of adjustment, they must be replaced. Standard equipment auxiliary canister air filter system on all Cheetahs. This provides increased service intervals and longer engine life. Easily adjust cutting heights from the seat with the convenient, easy to lift, 3-position adjustable foot pedal. Wide range of adjustment from 1.25" to 5" in 1/4" increments. Foot pedal parking brake allows the operator to apply the brake without taking their hands off of the steering levers. Once stopped, the steering levers can be put into neutral lock and the park lock lever can be activated, holding the mower in place. Ausco disc brakes feature a rotor and caliper style design for maximum holding power. Deck leveling adjustment bracket allows for easy in-the-field deck leveling adjustment. The steering dampers have three mounting positions (requires tools) to customize the resistance on the steering levers. Custom, mid-back, bolstered seat adds another level of comfort to the Scag Cheetah. Extra large 23 inch drive tires and up to 13 x 6.5 - 6 caster wheels ensure better traction, less turf tearing and easy curb climbing. Flat-Free front caster tires virtually eliminate downtime and expense caused by flat front tires. Tapered roller bearings are utilized in the front caster wheels and in the caster pivots for durability and reduced maintenance. Low profile dust caps on the caster yoke pivots resist damage from impacts and foreign objects. The front caster extension is replaceable in the event of damage from an impact. "Split-Steel" pulleys are used on load carrying areas like the cutter deck spindles and pump drive systems. Split steel pulleys are stronger than cast iron or stamped pulley designs. Our pulleys are strong for long life and lightweight for reduced inertia and decreased wear on the cutter deck drive system, including the PTO clutch. Flip-up footplate panel for access to center blade spindle, blade bolt and the top of the cutter deck. Operator friendly instrument panel includes an ammeter, ignition switch, mower engagement switch, separate choke and throttle controls. The hour meter is conveniently located in the instrument panel. 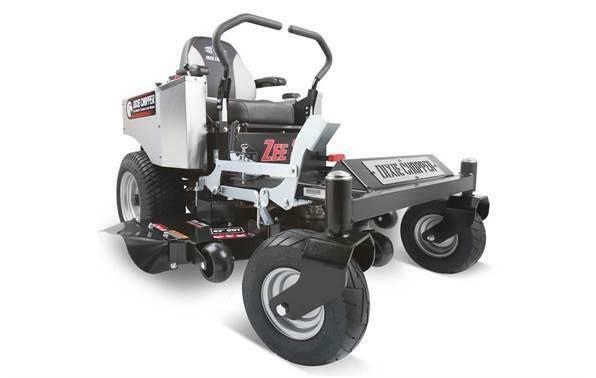 User-friendly mower design allows quick, clean access to the engine and filters, for easy maintenance. Rear hood and access panels require no tools to swing out of the way for access. Spring loaded idler arms effortlessly keep belts in constant, optimum adjustment for maximum life and minimum maintenance. Excellent hillside stability due to an exceptionally low center-of-gravity and extra wide stance. 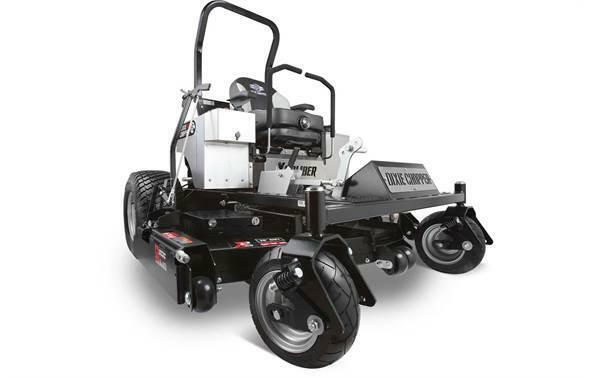 High quality electrical components such as switches, wiring and harness looms are used throughout the Scag mower line for trouble-free service. In-line sealed fuses are easily accessible should they need to be replaced. Digital hour meter displays maintenance reminders to help ensure that routine service is completed. The hour meter only runs when the engine is running for more accurate recording of operation time. There are many time saving, money making accessories for the Cheetah like the Tiger Striper lawn striping kit, spindle driven grass catchers,halogen light kits and more. Mulch Plate: Discharge opening block-off plates for 52", 61" and 72" Cutter Decks. Width (chute down): 65.25 in. Width (chute in transport position): 53.75 in. Height (ROPS up): 67 in. Height (ROPS folded): 48 in.